Randy rode his bike up this monsterous climb of 5000 feet in 18 miles. Nancy was very lucky and thankful to accepted a ride up by a dear man,John, a local resident. Thanks John Simmons Nancy got to ride up here in car with her luggage and Randy's! Meanwhile Randy worked his butte off as Nancy sat up at the top enjoying the views and creating watercolors. 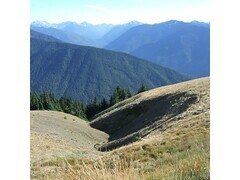 Up here can see all the way to mountains in Olympic National Park. I must say the ride down was fantastic and worth ride up. Here we are taking a moment to enjoy a special moment at Hug Point along the Oregon Coast as we ride up Route 101 to our campground near Ocean City. 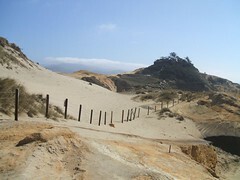 Oswald state park is a walk-in site next to premier surfing beach. The camping is an amazing experience where you haul your stuff down to the forested camp site in a wheel barrel down about a half mile to the site which is set next to the goreous surfing beaches. 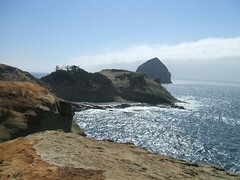 If there is ever a perfect place to photograph it must be Cape Kiwanda at Pacific City Beach. We have been riding along the Oregon Coast for the last 4 days. The big, wild Pacific coast is inspiring to experience. The beaches are nestled in between cliffs lined with towering evergreens leaning away from the oceans powerful offshore winds. 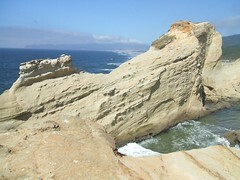 Occasionally parts of towering cliffs have collapsed down to the protected beaches. The beaches are wonderful places to walk, explore tidal pools, surf or even drive cars. Every corner offers a new photograph opportunity. We have camped at Oregon State parks which always have a place for bikers in hiker/bikers spots. Several have been in the middle of the rain forests. We have set up our tents under giant trees in Oswald Weest State Park and Cape Lookout State Park. We are in Lincoln City, Oregon, staying at a warmshowers.org bicycling host. Thank you Suzie and Jim. We sat in their jaccuzi and watched the sun set over the breaking waves. For almost two weeks we have been going to sleep with the sound of the ocean waves lapping at the evening darkness. I am finding the roads in Oregon mostly great with a few sections of hell. Today was a tough climb up a windy 4 lane section of highway 101. We're just having an amazing blast on the Oregon Coast. It has to be the most fun bike touring we've ever run into. Every day there's a new sight. Yesterday we went sandboarding on the dunes, and then Jason at Seaside Glass let Nancy help with the glassblowing and create a vase! Every night there's another beautiful State Park, with quiet, natural hiker-biker areas, for which we pay $4 each. And that includes the unlimited hot shower. And we meet the (many) other cyclists headed our way. We could spend a month on this coast, and the weather is just amazingly wonderful. We still have had only 1 rain in the last month, and it was one night at a rainforest in the Olympic National Park. We're getting mighty spoiled. The raingear has drifted to the bottom of the panniers. We're also out of bear country and have gotten sloppy about our food management. Last night a raccoon got into my food pannier and made quite a mess. No harm done, though. We just have to reorganize and get more granola, bread, milk, and coffee. A wakeup call though - just because there's no bears doesn't mean you don't have to take better care of food and trash. We haven't had much good solid internet access here in California, but we're having a fine time. In about 450 miles in California we've enjoyed many wonderful redwood forests (including a great day off hiking to Fern Canyon in the Prairie Creek Redwood State Park) and beaches and coastline galore. The coast is amazingly rough and the waves seem bigger here. Lots to watch. It's amazing that we've ridden just almost 4000 miles on our journey - it should be over 5000 when we get home, and maybe 20,000 or more when we get to Patagonia. This ride down the Pacific Coast has been about 1200 miles of bike-touring ecstasy. Beautiful beaches, perfect weather, easy campsites, a warm shower every night. We'll have to get used to more primitive situations as we head east. 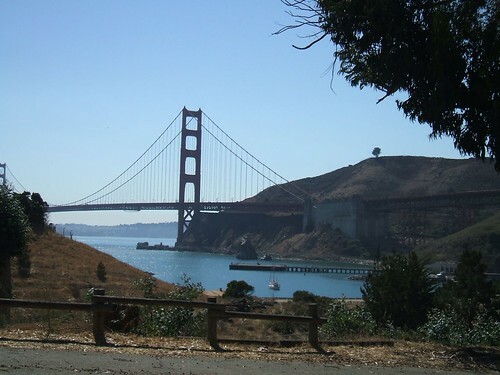 Tomorrow we ride over the Golden Gate bridge into San Francisco - it's a banner moment - the end of our southward motion for now. We'll head east from here to Sacramento and then over the Sierra Nevada and hoping to scurry home by the end of October. Wish us well with the weather in the Sierras and the high desert! We rode over the bridge and into the city and immediately found our way across town to a dentist (Randy had a crown come off a few days ago). Then we crossed through downtown at rush hour, dodging the cars and having a grand old time, to find our friend Stuart and new friends Dave and Shelagh. It was a grand day. The way into SF was a bit confusing, but along came Carlos and Monica, who were just out from the city for a weekend bike trip to the north. They led us all the way in through the towns to the north and we didn't have to follow the book turn-by-turn. It was a wonderful thing. We're thinking we'll take a few rest days here and explore the city. I actually went out and bought a computer here in San Francisco. We'll try touring with it and see how it works out. It's tiny and under 3 pounds, but still it adds to the load and of course is questionable that way. But I've been frustrated by the lack of access to computer time. 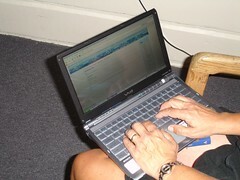 It's very frustrating to have to do all our updates and email in one 30-minute session at tthe library. We'll let you know how it goes. Will the weight be too much to add, or will the pleasure of having the right tool be just the right thing?